Kheda in Gujarat in support of the peasants who were not able to pay the land tax due to failure of crops. During this struggle, Sardar Vallabhai Patel emerged as one of the trusted followers of Gandhi. In 1918, Gandhi undertook a fast unto death for the cause of Ahmedabad Mill Workers and finally the mill owners conceded the just demands of the workers. With these three movements i.e. Champaran, Kheda and Ahmedabad mill strike movements Gandhi emerged as powerful political leader. In 1917, a committee was set up under the Presidentship of Sir Sydney Rowlatt to look into the militant Nationalist activities. On the basis of its report the Rowlatt Act was passed in March 1919 by the Central Legislative Council. As per this Act, any person could be arrested on the basis of suspicion. No appeal or petition could be filed against such arrests. This Act was called the Black Act and it was widely opposed. An all-India hartal was organized on 6 April 1919. Meetings were held all over the country. Mahatma Gandhi was arrested near Delhi. Two prominent leaders of Punjab, Dr Satya Pal and Dr. Saifuddin Kitchlew, were arrested in Amritsar. The Jallianwala Bagh Massacre took place on 13 April 1919 and it remained a turning point in the history of India’s freedom movement. In Punjab, there was an unprecedented support to the Rowlatt Satyagraha. Facing a violent situation, the Government of Punjab handed over the administration to the military authorities under General Dyer. He banned all public meetings and detained the political leaders. On 13th April, the Baisakhi day (harvest festival), a public meeting was organized at the Jallianwala Bagh (garden). Dyer marched in and without any warning opened fire on the crowd. The firing continued for about 10 to 15 minutes and it stopped only after the ammunition exhausted. According to official report 379 people were killed and 1137 wounded in the incident. There was a nationwide protest against this massacre and Rabindranath Tagore renounced his knighthood as a protest. On April 18, 1919, Gandhi withdrew the movement and called it a “Himalayan blunder“. Gandhi returned the Kaiser-i-Hind Gold medal given to him for his work during Boer war. One important outcome of people’s reaction to the martial law in Punjab was the demand for declaration of fundamental rights. Government appointed Hunter commission to find out the cause of issue. Although it condemned most of the decisions taken by General Dyer, it agreed with imposition of the martial law in Punjab. Maulana Abul Kalam Azad, M.A. Ansari, Saifuddin Kitchlew and the Ali brothers were the prominent leaders of this movement. A Khilafat Committee had been formed and on 19th October 1919, the whole country had observed the Khilafat day. On 23 November, a joint conference of the Hindus and the Muslims had also been held under the chairmanship of Mahatma Gandhi. Mahatma Gandhi was particularly interested in bringing the Hindus and the Muslims together to achieve the country’s independence. Subsequently, the Khilafat movement merged with the Non-Cooperation Movement launched by Mahatma Gandhi in 1920. The suspension of the Non-Cooperation Movement led to a split within Congress in the Gaya session of the Congress in December 1922. Leaders like Motilal Nehru and Chittranjan Das formed a separate group within the Congress known as the Swaraj Party on 1 January 1923. The Swarajists wanted to contest the council elections and wreck the government from within. After the passing away of C.R. Das in June 1925, the Swarj Party started weakening. Simon commission was appointed in 1927 to review the Government of India act 1919. All its seven members were Englishmen. As there was no Indian member in it, the Commission faced a lot of criticism even before its landing in India. Almost all the political parties including the Congress decided to oppose the Commission. On the fateful day of 3 February 1928 when the Commission reached Bombay, a general hartal was observed all over the country. Everywhere it was greeted with black flags and the cries of ‘Simon go back’. At Lahore, the students took out a large anti-Simon Commission demonstration on 30 October 1928 under the leadership of Lala Lajpat Rai. In this demonstration, Lala Lajpat Rai was seriously injured in the police lathi charge and he passed away after one month. The annual session of the Congress was held at Lahore in December 1929. During this session presided over by Jawaharlal Nehru the Congress passed the Poorna Swaraj resolution. Moreover, as the government failed to accept the Nehru Report, the Congress gave a call to launch the Civil Disobedience Movement. The Congress had also observed January 26, 1930 as the Day of Independence. Since then January 26th had been observed as a day of independence every year. The same date later became the Republic Day when the Indian Constitution was enforced in 1950. On 12th March 1930, Gandhi began his famous March to Dandi with his chosen 79 followers to break the salt laws. He reached the coast of Dandi on 5 April 1930 after marching a distance of 200 miles and on 6 April formally launched the Civil Disobedience Movement by breaking the salt laws. On 9 April, Mahatma Gandhi laid out the programme of the movement which included making of salt in every village in violation of the existing salt laws; picketing by women before the shops selling liquor, opium and foreign clothes; organizing the bonfires of foreign clothes; spinning clothes by using charkha fighting untouchability; boycotting of schools and colleges by students and resigning from government jobs by the people. Over and above all these, the programme also called upon the people not to pay taxes to the government. The British government adopted the strategy of talking to different political parties by convening the Round Table Conferences. The first Round Table Conference was held in November 1930 at London and it was boycotted it by the Congress. In January 1931 in order to create a conducive atmosphere for talks, the government lifted the ban on the Congress Party and released its leaders from prison. On 8 March 1931 the Gandhi-Irwin Pact was signed. As per this pact, Mahatma Gandhi agreed to suspend the Civil-Disobedience Movement and participate in the Second- Round Table Conference. In September 1931, the Second Round Table Conference was held at London. Mahatma Gandhi participated in the Conference but returned to India disappointed as no agreement could be reached on the demand of complete independence and on the communal question. In January 1932, the Civil-Disobedience Movement was resumed. The government responded to it by arresting Mahatma Gandhi and Sardar Patel and by reimposing the ban on the Congress party. On 16 August 1932 the British Prime Minister Ramsay MacDonald made an announcement, which came to be as the Communal Award. According to this award, the depressed classes were considered as a separate community and as such provisions were made for separate electorates for them. Mahatma Gandhi protested against the Communal Award and went on a fast unto death in the Yeravada jail on 20 September 1932. Finally, an agreement was reached between Dr Ambedkar and Gandhi. This agreement came to be called as the Poona Pact. The British Government also approved of it. Accordingly, 148 seats in different Provincial Legislatures were reserved for the Depressed Classes in place of 71 as provided in the Communal Award. The third Round Table Conference came to an end in 1932. The Congress once more did not take part in it. In 1937 elections were held under the provisions of the Government of India Act of 1935. Congress Ministries were formed in seven states of India. On 1 September 1939 the Second World War broke out. The British Government without consulting the people of India involved the country in the war. The Congress vehemently opposed it and as a mark of protest the Congress Ministries in the Provinces resigned on 12 December 1939. During the course of the Second World War in order to secure the cooperation of the Indians, the British Government made an announcement on 8 August 1940, which came to be known as the ‘August Offer’. The August Offer envisaged that after the War a representative body of Indians would be set up to frame the new Constitution. Gandhi was not satisfied with is offer and decided to launch Individual Satyagraha. Individual Satyagraha was limited, symbolic and non-violent in nature and it was left to Mahatma Gandhi to choose the Satyagrahis. Acharya Vinoba Bhave was the first to offer Satyagraha and he was sentenced to three months imprisonment. Jawaharlal Nehru was the second Satyagrahi and imprisoned for four months. British Government in its continued effort to secure Indian cooperation sent Sir Stafford Cripps to India on 23 March 1942. This is known as Cripps Mission. The major political parties of the country rejected the Cripps proposals. Gandhi called Cripps’s proposals as a “Post-dated Cheque”. The Muslim League was also dissatisfied as its demand for Pakistan had not been conceded in the proposal. The All India Congress Committee met at Bombay on 8 August 1942 and passed the famous Quit India Resolution. On the same day, Gandhi gave his call of ‘do or die’. On 8th and 9th August 1942, the government arrested all the prominent leaders of the Congress. For once, this pre-planned action of the government left the Indian people without leadership. Mahatma Gandhi was kept in prison at Poona. Pandit Jawaharlal Nehru, Abul Kalam Azad, and other leaders were imprisoned in the Ahmednagar Fort. This time, leadership was provided by Ram Manohar Lohia, Achyuta, S.M. Joshi and Jaya Prakash Narayan. On 2 July 1943, Subhas Chandra Bose reached Singapore and gave the rousing war cry of ‘Dilli Chalo’. He was made the President of Indian Independence League and soon became the supreme commander of the Indian National Army. He gave the country the slogan of Jai Hind. The names of the INA’s three Brigades were the Subhas Brigade, Gandhi Brigade and Nehru Brigade. The women’s wing of the army was named after Rani Laxmibai. After Japan’s surrender in 1945 the INA failed in its efforts. Under such circumstances, Subhas went to Taiwan. Then on his way to Tokyo he died on 18 August 1945 in a plane crash. After the Second World War, Lord Atlee became the Prime Minister of England. On 15 March, 1946 Lord Atlee made a historic announcement in which the right to self-determination and the framing of a Constitution for India were conceded. Consequently, three members of the British Cabinet - Pathick Lawrence, Sir Stafford Cripps and A. V. Alexander - were sent to India. This is known as the Cabinet Mission. The Cabinet Mission put forward a plan for solution of the constitutional problem. 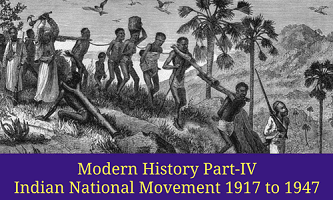 Provision was made for three groups of provinces to possess their separate constitutions. The Cabinet Mission also proposed the formation of a Union of India, comprising both the British India and the Princely States. The Union would remain in charge of only foreign affairs, defence and communications leaving the residuary powers to be vested in the provinces. A proposal was envisaged for setting up an Interim Government, which would remain in office till a new government was elected on the basis of the new Constitution framed by the Constituent Assembly. Both the Muslim League and the Congress accepted the plan. Consequently, elections were held in July 1946 for the formation of a Constituent Assembly. The Congress secured 205 out of 214 General seats. The Muslim League got 73 out of 78 Muslim seats. On 20 February l947, Prime Minister Atlee announced in the House of Commons the definite intention of the British Government to transfer power to responsible Indian hands by a date not later than June 1948. Thus, to effect the transference of that power Atlee decided to send Lord Mountbatten as Viceroy to India. After extensive consultation Lord Mountbatten put forth the plan of partition of India on 3 June 1947. The Congress and the Muslim League ultimately approved the Mountbatten Plan. The partition of the country into India and Pakistan would come into effect from 15 August 1947. The British Government would transfer all powers to these two Dominions. The Act provided for the transfer of power to the Constituent Assemblies of the two Dominions, which will have full authority to frame their respective Constitutions. The Radcliff Boundary Commission drew the boundary line separating India and Pakistan.